When you’ve just brought your bundle of joy home it can be hard to relax whenever the baby’s on their own somewhere, usually asleep. All you want to do is know that they’re safe and sound without disturbing them or being on edge all of the time unable to relax. Well, that’s where baby monitors come in to help. With modern baby monitors, you can keep your eyes and ears on your baby without disturbing them to give parents peace of mind. Best For Mums have reviewed over 40 baby monitors and narrowed it down to a top 12. Out of the top 12 it is our opinion that the best baby monitor currently on the UK market and available to buy is the HelloBaby Monitor! You can read the full review of that baby monitor here. With so many baby monitors on the market and the need to generally only buy one of them, it can be difficult and confusing to decide which one is the best. Here at Best for Mums we have parents best needs at the forefront of everything we do so we’ve compiled this list of what we think to be the best baby monitors you can buy in the UK and we’ve drilled them down into categories to help you make an informed decision. Here’s a quick table with our choice of 4 baby monitors we think you should definitely consider. The HelloBaby wireless video baby monitor earns its reputation as one of the best overall baby monitors on the market as it’s very competitively priced, has a host of features that we would look for and has the backing of a lot of reviews which suggests it’s reliable. There’s not much to not like about the HelloBaby monitor so let’s dive right in our review when we were able to put this to the test. The unit you’ll be using as a parent has a 3.2 inch colour screen which is not the biggest but certainly not the smallest out there, this screen size is pretty much in line if not generous with a monitor that tends to be available for less than £100. It’s easy to use, too and even the biggest technophobe will be able to move through the menus with ease. We tested the range and started getting problems when we reached around 200ft – their tests indicated the range was 960ft (just under 300 meters) in open air so this matches their estimate when you throw in normal household obstacles such as walls. The parent and baby unit communicate via encrypted 2.4GHz technology so there’s no risk of hacking or interruptions from other devices. We certainly didn’t encounter any. The display shows everything you need and it’s easy to cycle between modes (of which there are many, read below). The display also shows you the different levels of noise so you can see clearly if your baby is making ‘normal’ noises or not. The camera is really the most impressive part. We’ll start with the basics – the two-way talk feature is terrific and its crystal clear on both ends, it also features VOX mode so that the parental unit doesn’t flash up constantly. Next, we tested the night vision and found it to be at a very high standard – we could see clearly what was going on in a completely blacked out room – if night time was essential for you then this has got you covered. We then tested the temperature monitor and put it up against our dedicated temperature monitor and it passed the test, we then put a heater in the room (without the baby of course!) and the temperature alarm worked very quickly so you can rest assured if the temperature gets too high or low that you’ll be notified rapidly. The ability to zoom in and out is included as well as pan, scan and tilt which is a VERY generous feature for a sub £100 monitor and they all worked fluidly and flawlessly. With these features, it makes this camera not only handy when they’re a baby but from a toddler onwards too when they begin to get more mobile and learn how to escape from their bed! If you needed to have the camera soothe your baby then it also comes with 8 lullabies included. The baby unit is mains fed (190cm cable) while the parental unit is rechargeable so there’s no recurring battery cost to worry about, there are low signal and low battery alarms also included for peace of mind. This comes with a 1 year warranty. Baby monitors don’t come much better than the HelloBaby Wireless Video Baby Monitor, it has every single feature bar the movement sensor and you can get them all for less than £100 usually. There is almost no complaints towards this camera and a large number of reviews also backs it up. This is a serious contender as the best overall baby monitor on the market and well worth your time to research this. With over 1,000 positive reviews on Amazon it would be impossible to write a best baby monitor guide and not mention an Angelcare product. Angelcare have made their products with love and with a specific design in mind – as you can see the baby unit looks like an angel complete with Halo. A nice gesture but doesn’t have a bearing on performance but if you do care about the aesthetic of your nursery then this will score some points here. It’s worth noting that the Angelcare monitor is not a video monitor and only offers temperature, audio and movement sensing so be sure to bare this in mind. First of all, we tested the movement sensor with a live baby and found it to be quick to install and set up. We used another video camera to watch what kind of movements triggered the sensor and were pleased to report that the minor movements didn’t flag anything above the lowest point on the scale but were relieved that major movements were. Sometimes baby did not make a sound with the bigger movements so the two sensors worked hand in hand to keep us in the loop about baby’s goings on. The movement mat you placed under the mattress does stop this feature from being that portable as you’ll need to move the mat again to go wherever baby sleeps. This means that any impromptu naps will have to go without it – is that such a big deal? Probably not but we did need to make sure to mention it to be impartial. It is also not compatible with hollow core mattresses and memory foam mattresses. Next, we tested the audio monitor which operates on analogue 8 channels @ 864 MHz. It has a 250m range which is rather colossal and the quality is pitch perfect. We tested it as a walkie talkie between two adults at first and tried difference volumes of speech before testing it with a baby. The parental unit flashed just at the right noises (using TIC) and reported to us with either sound or vibrate so we never missed a thing. The parent unit has an out of range notification so even you did wander it will tell you as opposed to just not reporting any sounds. As for any bonus features it has a night light so that you can check up on baby visually without disturbing them (this is because there is no camera with this) or as a traditional night light which may come in handy when baby is a little bit older. The baby unit comes with rechargeable batteries and not mains fed. As mentioned earlier it’s been aesthetically designed to fit in to a nursery without obviously looking like a baby monitor. Because the Angelcare AC401 Monitor is not a video monitor and it has sensors which trigger as opposed to always being on we were able to get quite a lot of life from the 4xAAA batteries (which are included). We felt that the Angelcare AC401 is one of the better sound and movement sensors on the market and with so many reviews online it’s not a coincidence. With simply features and an easy to read parental unit it doesn’t get much easier than this. If you don’t feel a video monitor is necessary but you need more than just sound then this could be the baby monitor for you. It’s neither cheap nor expensive but it is excellent value for money for what you get. Let me start this review by saying that this camera is amazing value for money right off the bat. 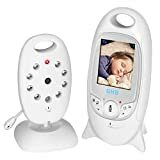 It’s not advertised as a ‘baby monitor’ as its pretty much a home camera that you can use to look after pets, elderly and so on but of course this can be used like a baby monitor just the same as monitors that are made specifically as a baby monitor. First thing we did is to test the two-way audio and the test came back with flying colours as we had crystal clear sound on both ends – to us this is the most important feature for any baby monitor so we were pleased with this. However, what it doesn’t have is sensitivity adjustment so it’s running all of the time as opposed to just when it hears anything. Second, we tested the quite frankly amazing video technology with this camera. There is no parental unit so you will need an app for your smartphone or tablet – this camera is a fully fledged smart camera which means you can do anything you want from the app even if you’re miles away. The video quality is 1080p which is full HD and they’e not lying – it really is that clear. Of course this comes with its drawbacks which is a strain on the router and it could eat up your data if the smartphone or tablet is not connected to the WiFi. The camera is completely panoramic and if placed correctly can record everything in the room. It also has night vision included. The notifications you get are handy for security purposes but a little lacklustre for baby related reasons, but this isn’t advertised as a baby monitor so we can’t exactly score it down too much. All we can advise is to make sure the phone with app is always available or get a cheap tablet you can use as a dedicated parental unit. Motion detection is also included. There are no bonus baby related features on this such as lullabies, temperature monitoring and so on. This is a home camera which can be adapted as a baby monitor. This is the audio/video monitor we feel is the best value for money as you can often pick this up for £40. The reason for that is because it’s not advertised as a baby monitor they haven’t chucked in a premium on the price. However, please be aware this is not a baby monitor and does lack bonus features such as lullabies, temperature control, breathing monitor and so on. However, if you want an audio/video monitor only and as much bang for your buck as possible then this is the one for you. Seriously, it’s a great piece of kit! The SpotCam BabySense HD WiFi monitor is one of the creme de la creme of baby monitors as it comes with a plethora of features, accessories and the fact that it’s a fully fledged smart monitor in the purest of senses as it can communicate with your existing AI assistants such as Alexa or Google Home. It doesn’t get much better (or more expensive) but how does it rank in our list of the best baby monitors? We take this bad boy for a test so let’s go. It was easy to set up the monitor and connect everything together and to the WiFi – as an estimate we would probably say it took us around 10 minutes in total to get the app up and running. We tinkered a bit to get the positioning right and then to get the app to show us exactly what we wanted to see. Please note that with any monitor that uses WiFi then the reliability of your home WiFi system will be under scrutiny – if you have an unreliable router or signal then be sure to get this fixed! Batteries are required (3 x AAA) and it’s not mains fed, which is disappointing. The range of the devices depends on the WiFi range so consult your routers manual. First of all, we tested the two-way audio capabilities and found the quality to be at an acceptable level – the user adjustable settings on the app made it possible to adjust the sensitivity, volume and at what point alerts were given. We found no problems with the quality. However, when we put the WiFi under stress the quality dipped and when the router was turned off it stopped working completely, but we did get a warning and you shouldn’t really be out of the house when your baby is alone even with a camera. The video quality was absolutely stunning at full 1080p resolution. To put it simply, this is the best quality video we’ve seen in a baby monitor. The frame rate sat at 30 per second and although thats not quite as good as your own eye it’s as close as you’ll ever get. There was little to no lag unless the router was under heavy stress or it was turned off with no internet – then it just didn’t work. The lens is a 155-degree aspherical lens for enhanced picture quality so not only is the quality great but you can also see an awful lot. Night vision is also in there, of course. On top of audio and visual this baby monitor also has temperature, humidity and lux (light) levels in the area it’s set up in. We thoroughly tested these three features and they all came out golden. The temperature monitor matched our dedicated one, the humidity one did the same and the lux monitor flagged up when we purposefully made a room too bright – we liked this feature but didn’t find it overly necessary. But, this monitor prides itself on being able to do everything! Included with the camera is a movement sensor and a Nanny breathing monitor which is a USP of the SpotCam BabySense. Both of these features were superb and worked better than we expected. This was difficult to test as you can image as we needed to take the breathing monitor off the baby to simulate stop and start and we were alerted quickly, we then ignored the alarm and the alert becomes even more severe so you simply can not ignore it. A couple of reviews online have mentioned this has been a literal life saver, however we feel it’s dangerous to suggest that your baby is at risk if you didn’t have this device. The movement pad you place underneath the mattress works but it is very sensitive! It may take some time to get used to and you may need to move the bed a little further away as any ‘extra’ movements it detects will set off an alarm. In some of the reviews we’ve seen by others they noted that movements from other rooms also threw it off. In the box you only get the camera and no parent unit because it has an app. This feels like you’re getting shortchanged but believe us the time they took to make the app more than matches the time others will have taken to make the parent unit. Plus, more than one user can use and app so that mum, dad, uncle, grandad and a childminder can all view the feed via an internet based device. Thanks to IFTTT technology you can even allow people to only be able to see the feed when they enter the house and turn off when they exit, this is definitely not something you can do with non smart monitors. Despite all the stuff it does have it seems odd they didn’t throw in lullabies in there. There’s an awful lot to say about this monitor as it really stand out as one of the most unique and possibly “luxury” baby monitors. As a smart monitor it’s quite expensive which means it may be out of the question for many budgets but for those who can afford it you’ll get a cracking camera with loads of features and some bonus ones such as the breathing monitor. 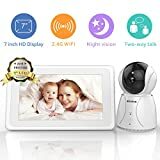 Reviews online are excellent which backs up our opinion that this is one of the better baby monitors and perhaps the best smart baby monitor. The GHB Video Baby Monitor is an excellent choice for anyone and one one of the strongest contenders for the Best For Mums Platinum award for being so good for so little money. In the box you will get the baby part and the parent which shows you the video feed on a 2.0 inch LCD colour monitor which seems awfully small when you compare to modern day smartphones but the picture is clear and you can see everything you need to see when placed correctly. There is no zoom or rotate though so make sure you’re happy with the positioning before leaving your baby. The baby camera is on a stand and is so super easy to install and because it has a flexible neck it can be placed higher up and tilted down. The camera unit will need to be plugged in to work so it can’t be absolutely anywhere but as it will always be in the baby’s room it would be extremely rare for there not to be a free outlet. We tested the infrared night time mode and we could see everything perfectly fine with no issues. When we tested the audio quality we couldn’t ask for more, we could hear noises clearly and when we tested the VOX mode it picked up significant noises and didn’t for general rustling so you won’t be disturbed needlessly by this. However, it must be noted that VOX mode is an option and not always on – please check the settings! We tested the temperature monitor and it worked just as well as the dedicated temperature monitor we use so this gets a 5/5 here. We also tried the lullabies and they are easy to set up and work as well as you’d imagine a small device like this would. We also tested the 2.4 GHz FHSS Wireless Technology which pairs the baby and parent units together and found no issues altogether. We made sure to put ‘everyday’ obstacles in the way and it did not fail. We only live in a small house but we were still able to put both units at the furthest possible points and there was no drop in signal at all. This is not a smart monitor so you can not use an app. GMB advertise a battery time for the parent module to be 2 hours but in our tests we got 1 hour to an hour and a half before it needed to be plugged in. This sort of battery life is pretty much in line with the cost but it is worth considering. It features 2-way talk so you can keep respond and try to soothe your baby yourself if you feel the need to. Infrared night vision so you can still keep an eye on your baby even in pitch dark. Temperature monitoring is also packed in to give you added peace of mind if the room is hotter or colder than it should be. The GHB Video Baby Monitor has the power to surprise you with most of the features you’d expect from a top of the line baby monitor without the cost. We found this product to be a doddle to install and set up and it’s portable, too. The audio and video quality are all top notch and the VOX mode works perfect so that you will only hear stuff when you need it. This is not a smart monitor so you are tied to using the units but that may not be a big deal for everyone. Lastly and perhaps most importantly this monitor is competitive priced and one of the biggest returns on investment in our reviews. We would highly recommend this monitor as would 250+ mums and dads on Amazon. 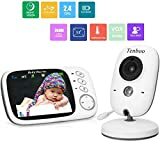 The BT Video Baby Monitor 6000 is one of the most expensive but feature rich cameras on the list and appears somewhere on several top ten lists in regards to baby tech. The reason we have chosen to discuss the 6000 is because it is the top of the range model in the BT monitor range. Let’s start by discussing the camera itself. The camera’s biggest feature over the rest of the series is the remote pan and tilt display – this means that if you want adjust or move the camera around you can do so at your leisure – would you ever need to? Well, if you’ve set it up in hurry and forgot then yes it probably would be handy but if the camera was already at the correct angle then it becomes redundant. However, this feature means that this camera can be very useful once your baby becomes a toddler and is a bit more mobile! This makes this camera not only handy now but an investment later. The camera has a working temperature control which matched the reading our dedicated temperature monitor found. Great night vision is also built in which displayed a crystal clear picture on the other end. If your baby has been disturbed then there’s 5 lullabies included and of course 2 way audio if you want to soothe them yourself. The lullabies are a bit on the low side with only 5 and the absence of womb sounds/white noise is noticeable considering these are present in some of the budget monitors we’ve tested. The baby unit comes with a mains adapter and must always be plugged in. What we did note is that the volume of the noise coming from the parent unit to the baby unit is louder than you think so you’ll need to keep your voice down! As for the receiver, it has a large 5″ in colour screen that is not HD but the quality is not poor, however for the price tag some people expect HD despite the fact that it wouldn’t really make a difference to the purpose the baby monitor served. The quality of the video was never an issue and we never once wished we had it slightly better so do not worry about this point. The receiver has lights to show you how loud it is which saves on batteries and saves you from being alerted by your baby rustling and babbling. The sound quality when noises were made was crisp and clear and as good as you’d expect from the price tag. The parent unit is a cinch to use even for technophobes and set up is quick. This unit can be plugged in to mains or with the use of batteries. BT advertise a battery life of 4 hours but from our tests we’d say it us UP TO 4 hours as our tests meant that we used it more than you would normally. The range is up to 250m which is pretty massive for your average house that isn’t a manor. We were also never let down by the quality dropping at any time. The BT Video Baby Monitor 6000 is one of the premier baby monitors on the market and for many satisfied customers the holy grail. It’s feature rich and there is not much this camera can’t do that you would want it to. The 5″ display gives you a very clear picture day or night and the audio quality and feedback lights mean you will only be notified when there’s something worth being notified about. It’s expensive but that is to be expected when it’s so feature packed. This may be the only baby monitor that you’ll need. Ever. 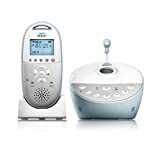 The Philips AVENT DEC baby monitor is an odd looking audio baby monitor with a couple of other special features which separates it from the left to give it a bit of a unique edge over some of the other models. As we mentioned previously this is an audio monitor only and there is no visual feed, however, it is feature rich aside from this. Here we’ll discuss how it performed in our tests. The first feature we tested was the two-way audio over 120 channels 1.9GHz frequency. The audio quality was exceptional to be honest which is possibly due in part to the fact that Philips is an established electronics company with decades of experience who have worked with this kind of equipment for a long time. The AVENT DEC audio can have its volume and sensitivity adjusted so we were able to test it ourselves and then with a real baby and it passed both times. We could hear exactly what was going on in both tests. The range on this monitor is colossal at 330m which is much larger than the average in this list, this is in part to the different DECT frequency it uses (120/1.9GHZ) as opposed to 2+GHz most of the others use. This could be an ideal audio only baby monitor for those with larger houses. The AVENT DEC also houses a temperature monitor which reported accurately and matched our dedicated temperature monitor in our tests which was reassuring. It also houses a night light for those who want to keep their baby monitor past the baby phase (who wouldn’t when they cost so much!) and a few lullabies to help put the baby to sleep in the first place. Just be aware that if you plat the lullabies that it can drown out baby’s actual noises. The bonus features we mentioned earlier are humidity monitor and MP3 playback. The humidity monitor we found to be a very good feature and one we’re surprised aren’t in many others; this looks at how much moisture is in the air and lets you know if its too humid (attracts bacteria, mould) or too dry and reports back – this is a fantastic feature for those who live in old houses or in a house that has a history of damp and mould. The second feature was a bit of a gimmick but may be handy for people who want to play their own lullabies to the baby – this is dead easy to install and the playback quality is decent. Finally, the AVENT DEC has a light projector which can create the illusion of stars on a ceiling – this is an amazing feature and one of the reasons is looks a bit odd. We tested it and altohugh the baby couldn’t tell us themselves we assumed they loved it as they slept straight through! 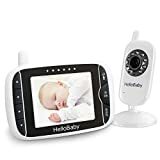 The Homiee HD wireless video baby monitor is one of the few baby monitors that has a high definition quality video on the parental unit and long with the large 5″ screen is one of it’s biggest selling points. Of course that isn’t the only great thing about this baby monitor but certainly one of the first things that stand out, along with the cute robot-like appearance of the baby unit of course. The first thing we tested was the two way 2.4GHz secure audio channel which we’re pleased to say came out crystal clear on both ends, it also includes ‘sound detective’ which means that you won’t get constant static and audio will only trigger when it’s of a ‘significant’ volume i.e you baby crying. The advertised range is 1000ft (300 or so meters) but this must have been open air testing as we started getting problems around the 270 meter range in a house with normal obstructions. 270 meters is a decent amount and suitable for most houses. The 2.4GHz channel is much more stable than a WiFi connection. The video feed this provides really is as good as they say it is. The resolution is 720p HD (1280 x 720) and it really is noticeable in comparison to other non-HD monitors. When there’s movement it’s a bit more fluid looking and of course the colours are vibrant. As an added bonus, the Homiee HD video baby monitor also has the ability to move 360 horizontally and up to 105 degrees vertically for a complete picture of the room – this makes this a bit of an investment post baby phase as when they’re mobile and moving around this camera will keep up with them. Lastly, the camera has zoom in/out mode if you want an even better view on the crisp HD feed! Added features are night vision which works as intended and along with the remote pan/tilt and zoom enables parents to see everything at any time day or night. Temperature monitoring is also included and works just as well as our dedicated monitor and it will notify you if it’s too hot or too cold – however, it will only let you know it’s too hot or cold with an alarm for one minute which seems a tiny amount of time considering the implications. Perfect. I you want to soothe your baby there are 5 lullabies also included and the audio quality on these is great, too. The camera is mains fed and the parent unit is rechargeable with a life time of 4 hours with screen on and 7 hours in power saving mode – considering the quality of the feed and the features this is incredible but otherwise it’s in line with the rest. It’s plug and play so out of the box you power them both on and they will pair in a few minutes flat. It’s really that simple. The UI on the parent unit is a doddle to use for anyone. Could this be the baby monitor for you? We certainly think that the Homiee HD Wireless Video Baby Monitor is well worth considering especially if you care about having a HD display as it is this monitor’s unique selling point. That said, this monitor still has all the features you’d want and they all work excellently. When shopping to buy a baby monitor make sure to put this in your shortlist. The BIGASUO Baby Monitor is a very strong contender for your business if you care about the size of the video feed you’re receiving as it’s biggest USP is the glorious 7″ parent unit. Of course, this isn’t a one trick pony and it is a baby monitor that’s feature rich. We would class this monitor as a ‘smart’ monitor as it needs WiFi and can connect to smartphones as well as parent unit. We took this bad boy out for a spin, here’s what we thought. We first tested the two way audio channel and found the quality to be perfect and the adjustable sensitivity and volume sufficient for us to find the perfect spot for our baby. The audio (and everything else as it goes) runs not the common 2.4GHz band which is very strong and reliable, we went ahead and tested the range and how far we could get before we encountered problems and that was around 250m or rather the range of the WiFi. As is the case with other smart monitors ensure your router is up to scratch before you get this. The VOX feature worked just as well as you’d expect. Next, we tested the video quality which has three different qualities – speed, standard and HD. The speed setting will save on battery and have the highest number of frames per second with standard and HD being slower but higher quality. We found standard to be the happy medium but we did enjoy the crisp HD picture from time to time. The BIGASUO monitor also has infrared night vision which once again can be speed, standard and HD if you really wanted it. Overall, the picture quality and the size of the parental unit is the stand out feature here so if you care a lot about that then this one’s for you. The compliments don’t end there. The BIGASUO baby monitor has the ability to pan and tilt freely to keep an eye on your baby all the way till they’re toddler. On top of that, this monitor can also give you a 360 degree view if you wanted as it comes with a bracket which can be used to place it on the sides of the cot, ceiling, wall etc. Even without the bracket you can still get a 270 degree view left and right and 120 degree up and down. The BIGASUO Monitor doesn’t just show a live feed it also records permanently and with the ability to hold 32 gb and more there’s a lot of footage you can treasure forever. Indeed, the BIGASUO’s video capabilities really impressed us here at Best For Mums. Other features include lullabies and a temperature monitor both of which performed to a high standard. Perhaps the only quarrel we have is that the lullaby volume can not be changed. There is a mains adapter for both units with the baby monitor always needing to be plugged in. Battery life on the baby unit is a little bit disappointing despite being rechargeable. The BIGASUO baby monitor is a wonderful monitor that will delight any owner. It’s USP being the very impressive video capabilities. 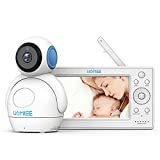 When this baby monitor is on offer it can become a strong contender for the best video baby monitor, however at it’s full RRP of £169.99 it might lose its edge a bit. 【5 Built-in Lullabies and Night Vision】Gentle lullabies help baby get into sweet dreams soon. View your baby and the room in low light even dark surroundings. 【VOX & Motion Alarming and Temperature Monitoring】 The baby monitor lets you keep an eye on the baby's behavioral dynamics and changes of environment. 【Included Features】7 Inch IPS display; 2.4g HZ wireless technology; VOX & Motion alarming; Temperature monitor; Night vision; Two-way talk; Motorized Pan/Tilt/Zoom; 5 Lullabies etc.Any Questions,contact us at ( bbmt.uk@bigasuo.co.uk ) first ,we will solve your all issues. You can probably guess that the BT 400 monitor is audio only and a basic audio only monitor for those looking to keep a tight grip on their budgets but still want some kind of a monitor. The quality of the sound is crystal clear and as good as any audio channel on even the most expensive smart and video monitors we’ve reviewed. This monitor advertises as ‘HD’ audio and we’d pretty much agree with that. Because it’s not a WiFi or internet monitor you will get zero interference from this and you’ll rest assured that it will be reliable. The range of the monitor is 50m indoors and 300m outdoors which is quite big. Because it’s basic, the battery life of the rechargeable batteries may seems endless. The batteries are charged in the parental unit. You may see in the image that this unit has LED lights so demonstrate how loud the noise it picks up and whether it’s a small shuffle or a full on cry. To be clear, this is a one way audio monitor only and does not contain two-way audio, lullabies or temperature control. This is not the best basic audio only baby monitor on a budget we’ve reviewed but it is the cheapest. If you’re on an extreme budget then this is the monitor for you as it’s reliable and cheap. Of course, this pales in comparison to any other monitor with more features. If you’re on an extremely tight budget then we would say it’s best to get this basic one than none at all. We know, we know, this is a dog camera and not a baby camera. 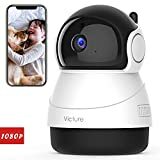 But similarly to the Victure camera we’ve reviewed this has all the features of a baby camera many would want without the premium price tag that a baby monitor holds. This is a smart monitor/camera with no parental unit so a smartphone or tablet is needed. It connects to the WiFi’s 2.4GHz band and is not 5GHz compatible. It needs to be always plugged in and comes with a bracket to make it easier to place wherever you want. First off, it has the two-way monitor that you’d need as a minimum with real time push notifications to the app. The audio quality is crystal clear without interference or any feedback (unless you’re in the same room speaking loudly). However, like other monitors which aren’t baby specific this is a bit of a downside as it isn’t live and you have to rely on getting a notification and then checking the feed. If you can get over that then you’ll be fine. Perhaps the biggest selling point of the IP camera is the camera. Although it is HD it isn’t “full HD” as they advertise as the quality is 720p and not 1080p. Despite that, the video quality is among the best there as it tends to be with smart monitors that don’t have a parental unit. With 4 times digital zoom and IR LEDs for night vision we had no complaints with the camera module. Because it is a smart monitor, when it detects motion you’ll get a notification to then check the feed so bare that in mind. You can pan and title 355 degrees horizontally and 120 degrees vertically for a near perfect view of everything in the room making it an ideal camera to keep beyond the baby phase. You can use SD cards up to 128 GB to keep treasured memories, too. That’s pretty much it for features as it does not have any baby specific features such as temperature monitor, lullabies etc but when you see the price you may find it a worthy trade off. 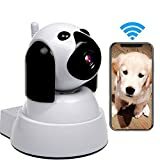 This may not be the greatest baby monitor in the list but it is definitely a good one and perhaps those who are looking for a baby monitor that can then be used as a dog camera and a home security device could have their head turned. The price point is very competitive which does make this a good overall package. As another reminder though, it does not have any bonus baby features past the two-way audio and HD video. Full HD Video: It will present you a face to face visual effect with 4 times digital zoom, HD 720P, and noise-reduction technology. Built-in powerful IR-LEDs for night vision up to 10-15m, you can see clear in night. Wide Viewing Angle: With remote pan/tilt, 355° horizontal and 120° vertical rotation range makes you see all corner clearly. Remote access, no matter how far you are, you can view the wireless security camera via phone/ipad/PC. Support different smart devices access at the same time. 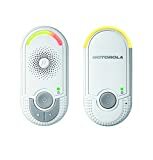 Two Way Audio &Motion Detect Alert: With built-in mic and speaker, remotely talk and listen. Talk to your family members, tell your dogs, warn the thief etc. 24-hour guard. Support real-time push notifications. Support micro sd card recording and playback, never miss any important minutes. Stable Connection to 2.4G WI-FI:This IP cam only supports 2.4G WiFi, can't supports 5G WiFi. Most routers has 2 different frequencies. 2.4GHz (which is better for covering more distance) and 5.0GHz (which is typically better speed). You can simply login to your 2.4GHz network to finish connecting. If you can't connect the camera, please press reset button 10 seconds to Reset it and reconnect. The Motorola MBP8 is an audio only baby monitor that’s designed for basic use and for those on a budget. The feature of this device is that both the parent and baby units plug into the socket with no cables whatsoever. This means it’s plug and play and always going to be on minus a power cut. This uses a 1.8GHz DECT channel which isn’t the best but wasn’t something we struggled with all that much at any time. The audio was crystal clear and the sensitivity was perfect for our house. However, we are aware that not everyone’s sockets are the same distance from where the baby is so for some people this may not be a good choice – if that’s the case you can just put in 2xAA batteries instead. They have a lifespan of 24 days with this. This also acts as a night light and features LED strips for noise levels. This is a very basic audio only monitor for those on a tight budget. Not all baby monitors have been created equal which is the exact reason this page needs to exist. There are some out there that are simply better than others due to better technology, higher build quality or simply reliability and ease of use. Baby monitors have benefitted greatly from technological advancements and are capable of a lot more than just a one way audio channel. Here we’ll explore some features you should look for when choosing the right monitor for you. A baby monitor has to have audio monitoring via a microphone and another device to relay the noise as an absolute minimum but what we would be looking for in our tests would be a monitor that can pick up noises at the correct volume (from the baby) and it needs to play the audio on the other end clearly and reliably. A baby monitor shouldn’t need to be placed right next to the baby to be effective so the ideal baby monitor should have a great microphone and speaker system. Secondly, there isn’t just one type of audio channel a monitor can use – you can get ones which are analog audio which can be susceptible to having their signal interrupted then you have digitally enhanced cordless telecommunications audio which is far more clearer and won’t get intercepted or interrupted. There aren’t many analogue monitors left on the market anymore but we thought it was an important to raise this anyway. You don’t want the receiver to play white noise back all the time and drain battery so a model with noise activation will be much better – the ability to be able to adjust the sensitivity is also desirable. Originally, baby monitors were glorified walkie-talkies that relayed the noises your baby makes but now infant monitors can and probably should have a built-in camera that can relay a live video feed to either an app on a smartphone/tablet or a paired device. Obviously, having a video feed will let you literally see what your baby is up to to give you peace of mind when things may seem too quiet. Still, not all video baby monitors are created so look for monitors which provide live feeds, that have high definition recording and perhaps most important of all the night vision recording as without it you wouldn’t be able to see anything for half of the day. How it records can differ from model to model, some may be always recording, some may start to record when motion is detected and others may need your input to begin or end. Make sure to consider which is best for your household before making a purchase. Not many of these baby monitors are plugged into the mains which means the monitor’s battery life plays an important part in whether a monitor is good or not – it could have the best scores in every other category but if the battery life is poor or it needs a lot of batteries then it just won’t make the cut and we couldn’t recommend it. We would also look at whether or not the baby monitor would tell you when it’s battery is low in a clear and obvious way, too. A rechargeable baby monitor is perhaps second best to one that’s plugged in terms of battery life, however a plugged in monitor is not as portable should you need to take it with you on holiday or wherever. Some parents may already have a temperature monitor or will be purchasing one separately. However, for those looking for a one stop shop monitor then we’d like to make you aware that some baby monitors also double up as a temperature monitor. At the end of the day, the monitor will always be in the room you’d want to track the temperature anyway so why not get something that will do everything? A temperature monitor module is not essential to be a ‘best’ monitor but in a dead heat this feature could be the deciding factor. Do you want to be notified when your baby moves? Some monitors may be able to pick up movements in the video feed or it may come with a motion sensor mat that sits underneath the mattress. Perfect for those who are particularly on edge about their babies well being but perhaps one step too far for others. However, we will do our due diligence to ensure that we’ve tested the best monitor with motion capabilities for those who are looking for the ultimate baby monitor. When choosing a suitable monitor you should consider what kind of notification and alerts you want to receive from the receiver. If you opt for a cheap model then it may just play the noise back to you but nothing else, the better monitors out there can have LED lights that will help you interpret whether the noise is ‘normal’ or if there is something worth checking up on. The same goes if your monitor has motion sensing and temperature monitoring features. If they’re only moving around slightly then you wouldn’t want your monitor to constantly give you false alarms or you’ll get frustrated and possibly interrupt your baby needlessly. A smart baby monitor compared to a normal baby monitor is similar to the difference between a smartphone and a regular mobile phone – a smart monitor can connect to your wifi and can use bluetooth to enabled live video streaming even if you’re not in the house. This may seem like an overkill and when would you NOT be in the house if you’ve left your baby alone is worth pondering over. WiFi capable smart monitors typically have better audi and sound quality provided your in home WiFi network is up to date and in good nick. If your home broadband is poor then expect the performance of your smart monitor to also be poor. The ability to play noises such as lullabies, white noise or womb sounds is another extra which can save you money from having to buy a noise machine and turn your baby monitor into an all in one tool. Playing sounds isn’t necessary to be able to be classed as a ‘best’ baby monitor as the noise coming from the monitor can drown the noise coming from the baby in poorer models. If money was no object then there probably would only be one best baby monitor in the list. However, for many new parents the cost of the baby monitor is important and they can’t simply afford to get the most expensive. With this in mind, Best For Mums have made sure to keep our tests balanced in light of affordability – we will clearly show you which is the best overall, the best budget and the best ‘bang for your buck’ baby monitor on the UK market you can buy now. For many, if not all parents, a baby monitor is an essential purchase but if you are on a tight budget we don’t want you to think you’ll just have to make do without one – like we keep saying in all of our reviews – here at Best For Mums we have ALL parents needs at the forefront of what we do and recommend.